Refugees are not an army of young fighting men invading their neighbor. Students are not a mob of rioters against free speech. No one is fooled by Nazis calling the righteous Nazis. 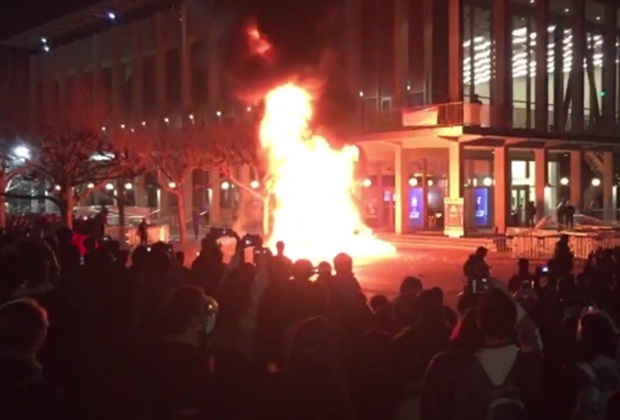 University of California Berkeley students destroyed university property in a riot against free speech on campus. Leftist universities are not breeding thinking adults or moral people. They are breeding Nazi terrorists who fit right in with the Islamo-Nazis that are invading Europe and America, with Obama’s assistance, claiming to be helpless refugees from the violence of the Jihad born of their own religion. Like Barack Hussein, this invasion is a Trojan Horse to dupe the unwary and witless of America’s warped college campuses where leftwing instructors teach communism and fascism as righteous. This is aggravated by the media that gives them a soap box far greater than they warrant, even stating the “the entire country is up in arms against Trump’s immigration ban,” every word a lie. CNN calls for no ban on Muslims, no border wall to make America an open doormat to invaders. When 80% of Moslems believe in imposing Sharia Law on the West, and 50% of them believe terrorism is a rightful jihadi tactic, there is no intelligent, moral reason to allow them to come to America. When Mexicans come to America who call for the southwest to be ceded back to Mexico, or who take jobs without paying taxes and send money they make back to Mexico, that is not compassion, that is stealing. Leftists advocate for Americans to allow thieves and terrorists free entry to America. CNN’s resident Moslem, Fareed Zakaria, stated that the chance of being killed by jihadi terrorist is 1:3.6m since 1975. Try refiguring those odds since Obama’s election. There has been a major terrorist attack in every year of his regime and numerous attacks and murders that are masked by the leftwing media. How many jihadi terrorist attacks did Obama call “workplace violence” as if it was just some maniac that went postal? The term postal originated from leftists who terrorized employers after being fired for cause, which was obviously justified, not to terrorists on Jihad. The false equivalency being created by leftists is only to disguise their true intent – the overthrow of the Constitution and establishment of a more tyrannical law like Sharia over America. Rula Jabreal proved how angry and hateful Moslems are toward America saying Trump’s ban is not about National Security, but about white supremacists creating a religious test for entry to America. She says this with a straight face when she knows that no Moslem country allows a Christian church to be built. She says this without conscience knowing that Moslems have tossed non-Moslems from their boats into the sea while “fleeing to freedom.” The refugee lie is evident in pictures of the young men flooding into Europe. Refugees are women and children, the old and infirm. President Trump advocating helping Christians escape Islamist murderers, people whom Obama blocked from refugee status, is a righteous cause. Helping Islamist jihadis and other foreigners invade is treachery. This entry was posted in Politics and tagged American Nazis, Democrats, Donald Trump, Fake News, Immigration ban, Leftists against free speech, Liberal media breeds Nazis, Liberalism, MSM propaganda, Muslim ban, Trump's Immigration Order, UC Berkeley riots against free speech, University riots. Bookmark the permalink.